How could a party which failed to hold a successful protest rally run a country? What was historic about September 5th? 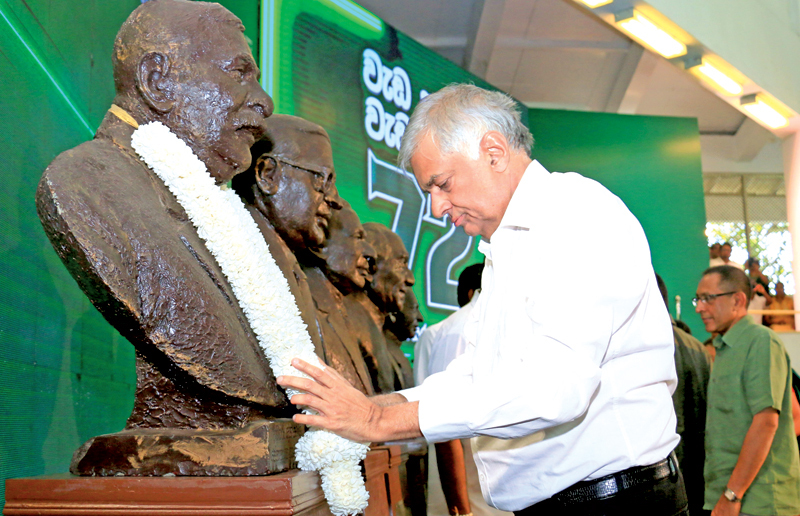 Prime Minister Ranil Wickremesinghe garlanding the bust of UNP founder and Father of the Nation, Rt. Hon. D.S.Senanayake at the 72nd anniversary celebrations held at the Party headquarters Sirikotha yesterday. Picture by Hirantha Gunathilake. Prime Minister Ranil Wickremesinghe yesterday queried as to how a party which failed to hold a successful protest could run a country. “No protest can defeat a legally elected government,” he said. The Prime Minister said that he has groomed the next set of leaders who would take the United National Party forward adding that it was time for the party to look to the future beyond the 2020 elections. “I have groomed the next line of leaders who would take on the party as it is time for the party to now think of its future beyond the 2020 elections,” the Prime Minister said. The Prime Minister was speaking at the 72nd anniversary of the party at its headquarters in Sirikotha. The Prime Minister referring to the failed attempt by the Sri Lanka Podu Jana Peramuna (SLPP) to hold its ‘Jana Balaya’ which was hailed as an attempt to topple the government, said that the party lost what little support it had from the people whilst the media has lost its credibility for giving it amplified publicity. “The other day, I received a few phone calls and most of them asked if we should postpone today’s event, the UNP’s 72nd anniversary, because the SLPP had threatened to take over the city of Colombo and topple the government,” he said. “We need to strengthen the party while the party is at work building the nation,” he said. “The UNP will not stop here, we will take our mandate forward, we will build this party from the grass roots upwards and we will clinch the leadership,” Prime Minister Wickremesinghe said. “This country, when we took over,was comparable to a neglected paddy field,” he said. “We took it over at a very tough period, but regardless of the setbacks, we’ve toiled hard, we’ve braved the storms, the floods and now is time to reap the harvests,” he said to resounding applause from the party members and supporters. “It wasn’t the UNP which called for elections too early,” he said. “The former government could no longer stay in power, they had to go. They were defeated,” the Prime Minister added. The Prime Minister said it was a government led by the UNP which finally met with banks that lent to this government, worked to regain the GSP+ preference and even with the existing financial constraints, increased the mahapola scholarship from Rs. 2500 to Rs. 4000. “We introduced an emergency ambulance service, an insurance scheme for all school children and we also gave leadership for women to enter politics,” he said. “The Prime Minister queried as to how a party which failed to hold a successful protest could run a country. “No protest can defeat a legally elected government,” he said.